HÀ NỘI — The art of making poonah paper from the bark of a tree for artwork and votive offerings is being revived in Yên Thái, a village outside Hà Nội that made the product for at least 600 years. The paper making will be centred in old style houses open to visitors early in the new year. The work is being carried out by Tây Hồ District’s People’s Committee. The houses will be placed in the campus of the Memorial of War Heroes and Martyrs, situated at 189 Trích Sài Street, Bưởi Ward, Tây Hồ District. The Memorial will also be used to introduce and display documentaries on Yên Thái craft village and beautiful sites in Bưởi Ward. Yên Thái Village is located near West lake. It once had 126 households making poonah paper. A private zone displaying sourvenirs, antiques, gemstones, Hàng Trống, Đông Hồ folk paintings, caligraphy and other specialties from Tây Hồ District will also be built for tourists, together with another area for outdoor leisure and entertainment. The production of the special paper will held every day of the week and will involve tourists taking part. Every Friday night, traditional perfomances will also be held. 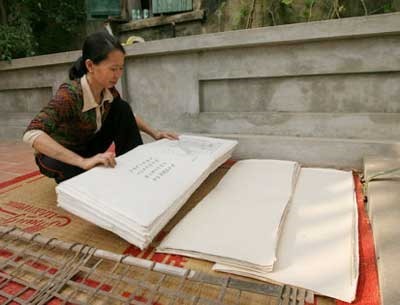 Tourists are also able to take part in some interaction activities with locals in the process of making the paper. Võ Bích Thủy, chairman of Tây Hồ People’s Committee and one of the members of the organising board, said the restoration created a new destination for tourists, as well as help preserve local values.